The Set comes with a versatile high table that is space saving and functional. A leaf is folded down for space saving and when in use, lift up the leaf for an extension of top surface. Top table area when leaf is up 39.37"W x 30"D x 35.43"H. Table when leaf is folded 39.37"W x 20.70"D x 35.43"H. Drop leaf 39.37"W x 10.31"D. Simple assembly required for Table. 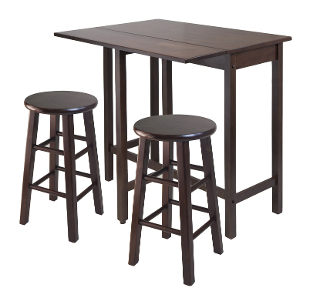 Pair it with 2 - 24" Height Square Leg stools to complete the set. Stools are fully assembled. Constructed in solid wood in warm Antique Walnut Finish. .